What are the differences between these two types of noise and why does it matter? Well, in order to deal with sound control one must understand how sound travels, and in residential environments it will either be airborne or structure-borne. Airborne noises are transmitted by air and atmosphere such as the radio, the barking of dogs or people carrying on conversations. 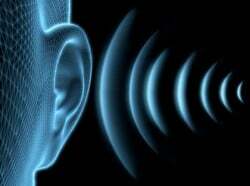 When sound waves traveling through the air reach a building element they hit it and cause it to vibrate. These vibrations travel through the structure or building and are radiated out the other side. Have you ever been inside of your quiet home as a loud party takes place next door or even down the street? It may have felt as if the music was reverberating loudly within your house. This is due to airborne noise traveling through windows and doors which is a major source of sound leakage. Structure-borne noises are transmitted when sound arises from the actual impact of an object on a building element such as a wall, floor or ceiling. Examples of this could be footsteps of a person or the sound of an object falling on the floor. Structure-borne sound occurs because the impact causes both sides of the building element to vibrate, generating sound waves. This can oftentimes be the hardest to isolate. The best way to stop sound is having mass, an air gap and mass again. This ensures that the sound waves have a difficult time penetrating through that space and continuing into your home. For windows, the common understanding is to install double pane windows which are costly and aimed at residents in a permanent location, not apartments. The reality is that double pane windows do little to block the sound and are more commonly used to increase insulation; their STC rating being an average of about 26. For doors, the standard hollow core doors with a ¾ inch gap at the bottom does little to nothing for sound isolation. A solid core door will provide more sound protection, but it sound still leaks through quite a lot at the base and edges. Even small openings within a home such as space around windows, doors, mail slots and vents will allow air to travel directly from the exterior to the interior of a home. Wherever air can infiltrate a home, sound can as well so be sure to add weather stripping for an added seal when possible. After studying the acoustical sciences we took into account all aspects of sound transmission when designing our soundproofing curtains. Our full line of AcousticCurtains and AcoustiDoors not only have Velcro on all sides to create a firm seal to the wall, the dense core and canvas fabric create the ultimate barrier for maximum sound blocking protection. Independently tested, we have a STC rating of 26.